Encrypt your data and online activities to prevent ISP monitoring and other intelligence authorities from following your digital footprints. Protection against DMCA notifications and a shield to guard you from being a victim of copyright infringement, which leads to massive fines and penalties. Experience unlimited torrenting with the fastest torrenting VPNs. If you’re an avid torrentor, then you need a P2P VPN (or Virtual Private Network) to keep your torrenting activities private and secure. While we don’t condone copyright infringement at VPN Analysis, we do believe in a truly free and open internet. And to keep your tech safe, you will need a great VPN for torrenting. We believe that you should be allowed to use whatever resources are out there, especially if it’s for your own benefit. As such, our team of VPN experts has taken the time to find the top five VPNs for torrenting and P2P activities in 2018. All of the VPNs listed in this article are not only excellent choices for P2P activities, but also excellent choices in general for your everyday online browsing. The top 5 VPNs for torrenting in 2019? Additionally, NordVPN allows P2P activities and offers excellent server speeds. NordVPN also provides CyberSec anti-malware protection, a Smart DNS service, dedicated IPs (at an extra cost), a double VPN and a system kill switch. If you’re still hesitant to try NordVPN, you can rest easy knowing they offer a 30-day money-back guarantee as well. For more information, visit NordVPNs website for more information. ExpressVPN is a VPN provider based in the British Virgin Islands that offers an excellent service to filesharing users (and users in general). To start, ExpressVPN provides you with excellent military-grade OpenVPN encryption, a strict privacy and no logs policy and DNS/WebRTC leak protection. Additionally, ExpressVPN offers 90+ server locations with fast speeds to go along with them and “stealth servers” located in Hong Kong for additional privacy. ExpressVPN also includes a free Smart DNS service in their package. If you have any issues with your service, ExpressVPN’s dedicated 24/7 customer support will be there to help you in a very timely manner. Finally, ExpressVPN also offers a 30-day money-back guarantee for unsatisfied users. Visit ExpressVPNfor more information about their VPN. In addition to its accessing blocked content capabilities, PrivateVPN also offers amazing speeds for streaming that blocked content. PrivateVPN also offers an easy-to-use app for the less tech-savvy users. A downside to PrivateVPN – you have to manually configure the DNS via the provided guide. Fortunately, the guide isn’t hard to follow at all. PrivateVPN also offers a 30-day money-back guarantee for unsatisfied users. Take a look at PrivateVPN for more inform. PIA or PrivateInternetAccess is a VPN service that is well-known for its affordable pricing. PIA offers users an airtight privacy and no logs policy – an excellent feature for P2P users – along with military-grade OpenVPN encryption, 25+ server locations and fast server speeds. Additionally, PIA provides DNS leak protection and a killswitch. A downside to PIA – they’re based in the US. This means if they were served a warrant, they’d have to comply. This is where their no logs policy comes in – they might have to comply, but there’s not much they can offer up. Finally, PIA does offer a 7-day money-back guarantee for unsatisfied users. Take a look at PrivateInternetAccess for more information. If you’re still skeptical on why a torrenting VPN is necessary, continue reading our Frequently Asked Questions (FAQ) section below. Why is a VPN Necessary For Torrenting? P2P (or peer-to-peer) filesharing is – clearly – dependent on the mutual sharing of files. When you’re torrenting a file, you’re sharing your IP address with every other person torrenting that same file. They can see your information and you can see theirs. Think about that for a moment: every single file that you torrent is sharing your IP address with everyone else torrenting that file. If that’s not already an invasion of privacy in your mind, maybe this will be – imagine copyright holders that monitor the distribution of their property via torrenting. If every person that torrents the same file as you can see your IP address…so can the copyright holders. This is where a VPN comes in. A VPN or Virtual Private Network is an online service/technology that lets you hide your online activities from prying eyes via encryption. When you use a VPN while torrenting, the IP address of the server your connected to will appear in place of your actual IP address. In other words: when you use a VPN for P2P activities, you’re keeping your true identity secure and private from everyone and anyone (including the copyright holders). 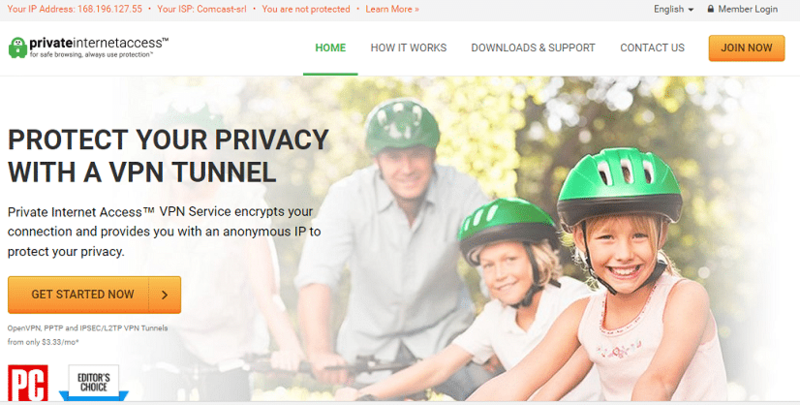 How does a P2P VPN protect me? A P2P VPN can protect you in a variety of ways. First and foremost, a P2P VPN will secure your connection via encryption. When you’re connected to a VPN server, your online identity is masked so-to-speak. This means that your ISP can’t see your online activities. Not only can they not see what you’re torrenting – they can’t see that you’re torrenting in the first place! Using a P2P VPN also masks your real IP address from everyone, including other filesharing users and the copyright holders monitoring the downloads of their property. Protecting your online identity is extremely important in today’s digital age, whether it’s protecting it from cyber criminals, copyright holders, governments, or simply your ISP. How do I Choose The Right VPN? Fortunately, the solution to this is simple – purchase a VPN subscription that permits torrenting! Most VPN providers will make it clear on their website whether P2P activities are permitted or not. Of course, the five VPNs listed in this article permit torrenting. As well as having all of the features listed above, the we have made sure to pick affordable VPNs. If you stick to our recommendation, you won’t go wrong. Yes, it is completely legal to torrent content that isn’t copyrighted. That being said, it’s more common for filesharing users to torrent copyrighted content than not copyrighted content. And unless you live in a country like Switzerland, torrenting copyrighted content can lead to legal troubles. Have you ever gotten the “friendly warning” letter from your ISP about copyright infringement? Sometimes, instead of the friendly warning, you get letters in the mail demanding a cash settlement for the damages your piracy activities have caused. Sometimes they skip the letter and summon you straight to court. Instead of risking legal consequences, you should skip the situation in the first place by using a P2P VPN to participate in filesharing activities. What About NAT Firewalls and Port Forwarding? It’s not uncommon for VPNs to implement NAT firewalls in order to protect users, although the overall necessity of a NAT firewall is still debatable. If the VPN you’re using has a NAT firewall, you might notice that torrenting takes a lot longer than it should. There is a solution: port forwarding. With port forwarding, you’re able to route inbound peer connections through your VPN’s NAT firewall. This not only helps with torrenting speeds, but also with the overall efficiency of the P2P network as a whole. Some VPNs require port forwarding to be configured manually. Others offer features like the NAT Port Mapping Protocol (NAT-PMP) and UpnP port mapping. A few of the VPNs listed in this article do include port forwarding. If you’re an avid torrentor, a P2P VPN is necessary. Don’t let laziness get in the way of maintaining your digital privacy. Try one of our recommended torrenting VPNs today. Great list of torrent VPN. I am living in Russia and 2 months ago I bought it through your website. It has been working like a charm. No drop in speed, as you have mentioned in your ExpressVPN review. Can I watch BBC iPlayer with this ExpressVPN account? What do you say? I don’t want to get caught. Hi Sonia, as of December 2016, iPlayer can be watched with ExpressVPN, so the answer is yes, you can use it to unblock iPlayer.